After much anticipation, Cigar Aficionado has finally unveiled their #1 Cigar of the Year. And the winner is…..
With its exaggerated figurado shape and 64 ring gauge foot, La Flor Dominicana’s Andalusian Bull commands your attention as soon as you lay eyes on it, but it’s the medium-bodied cigar‘s full, round, and eventful tasting profile that propelled it to become the first La Flor Dominicana cigar ever to land the #1 spot. Brand owner Litto Gomez based the Andalusian Bull’s unique shape on a vintage cigar mold he acquired on a trip to Belgium. 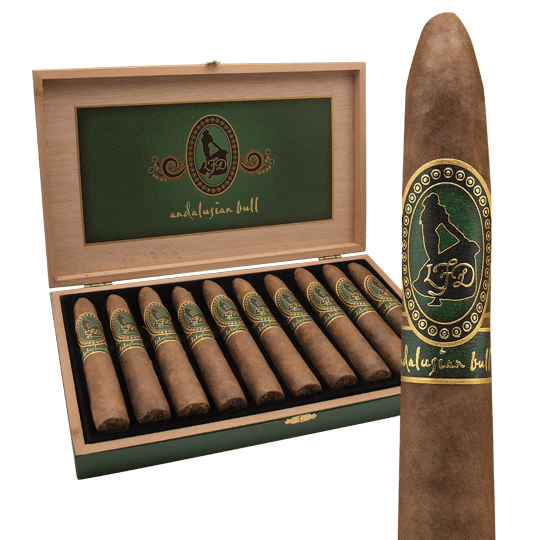 Named as a tribute to Gomez’s Spanish heritage, the Andalusian sports a Corojo-seed Ecuador Habano wrapper over a blend that consists primarily of Dominican Criollo ’98 tobacco, with just the right touch of Pelo d’Oro to deliver a creamy smoke offering balanced notes of hickory, leather, baking spice, peppercorn, hints of mint, and more. Congratulations to Litto and the team at La Flor Dominicana on receiving the great honor of being named #1 Cigar of 2016. Some might say it’s about time for the best-selling brand; after all, they’ve been pumping out strong, savory, and truly satisfying cigars since the “Boom” of the early 1990s.